Four outstanding Alberta lawyers were recognized for excellence at the 2018 Distinguished Service Awards ceremony held on January 24, 2018 in Calgary. The Law Society of Alberta and the Canadian Bar Association – Alberta presented the awards. View the program. Four outstanding Alberta lawyers were recognized for excellence at the 2017 Distinguished Service Awards ceremony held on January 26, 2017 in Edmonton. The Law Society of Alberta and the Canadian Bar Association – Alberta presented the awards. View the program. Pictured (back row left-right) The Hon. 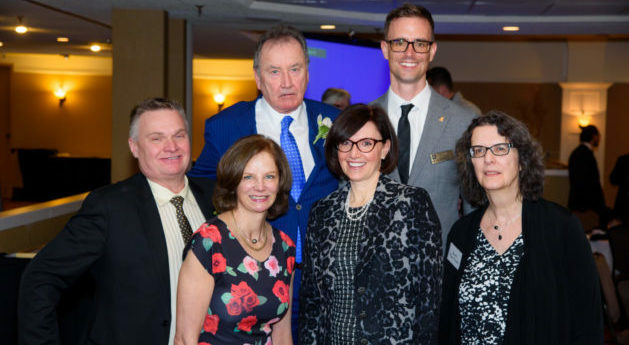 Robert A. Philp, QC; Jeremiah Kowalchuk, CBA Alberta President; (front row left-right) Buddy G. Melnyk; Virginia Engel, QC; Anne Kirker, QC, Law Society President; Professor Jonnette Watson Hamilton. 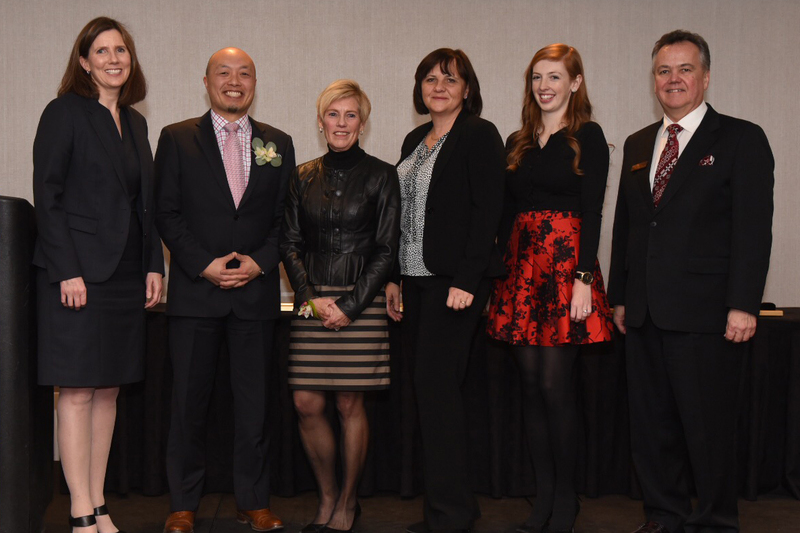 Four outstanding Alberta lawyers were recognized for excellence at the 2016 Distinguished Service Awards ceremony held on January 29, 2016 in Calgary. The Law Society of Alberta and the Canadian Bar Association – Alberta presented the awards. View the program. The recipients of the 2016 Distinguished Service awards and their presenters are (left to right): Wayne Barkauskas, CBA Alberta President; Douglas G. Moe, QC; Michelle C. Christopher, QC; Professor Mitchell McInnes; Christine Pratt; and James Eamon, QC, Law Society President. Three outstanding Alberta lawyers were recognized for excellence at the 2015 Distinguished Service Awards ceremony held on January 30, 2015 in Edmonton. The Law Society of Alberta and the Canadian Bar Association – Alberta presented the awards. View the program. The recipients of the 2015 Distinguished Service awards and their presenters are (left to right): Kevin Feth, QC, Law Society President; Bruce Churchill-Smith, QC; Hersh Wolch, QC; Mr. Peter Wong, QC accepting on behalf of Mr. Stopa’s family; and Steve Mandziuk, QC, CBA Alberta President. Four outstanding Alberta lawyers were recognized for excellence at the 2014 Distinguished Service Awards ceremony held on January 31, 2014 in Calgary. The Law Society of Alberta and the Canadian Bar Association – Alberta presented the awards. View the program. Pictured (left to right): Shannon K. O’Byrne; Norman F.W. Picard, QC; Erin Runnalls; Lonny L. Balbi, QC; Carsten Jensen, QC, Law Society President; and Marian De Souza, QC, CBA Alberta President. Four outstanding Alberta lawyers were recognized for excellence at the 2013 Distinguished Service Awards ceremony held on February 1, 2013 in Edmonton. The Law Society of Alberta and the Canadian Bar Association – Alberta presented the awards. View the program. Pictured (left to right): Arlene J. Kwasniak; Thomas R. Owen; Alexander D. Pringle, QC; and Yessy Byl. Four outstanding Alberta lawyers were recognized for excellence at the 2012 Distinguished Service Awards ceremony held on January 27, 2012 in Edmonton. The Law Society of Alberta and the Canadian Bar Association – Alberta presented the awards. View the program. Pictured (left to right): David P. Jones, QC; W. Laird Hunter, QC; Cheryl C. Gottselig, QC; and Michael F. Casey, QC. Four outstanding Alberta lawyers were recognized for excellence at the 2011 Distinguished Service Awards ceremony held on January 28, 2011 in Edmonton. The Law Society of Alberta and the Canadian Bar Association – Alberta presented the awards. View the program. Four outstanding Alberta lawyers were recognized for excellence at the 2010 Distinguished Service Awards ceremony held on January 29, 2010 in Edmonton. The Law Society of Alberta and the Canadian Bar Association – Alberta presented the awards. View the program. The recipients of the 2010 Distinguished Service awards and their presenters are (top row, left to right): Professor Gerald Gall, OC; Gillian Marriott, QC, CBA Alberta President; Peter Michalyshyn, QC, Law Society of Alberta President; and Solomon J. Rolingher, QC. (Bottom row, left to right): Virginia M. May, QC and Margaret Weir Andreassen, niece accepting on behalf of the late John A. Weir, QC. Four outstanding Alberta lawyers were recognized for excellence at the 2009 Distinguished Service Awards ceremony held on January 30, 2009 in Edmonton. The Law Society of Alberta and the Canadian Bar Association – Alberta presented the awards. View the program. The recipients of the 2009 Distinguished Service awards and their presenters are (left to right): Diane Young, CBA Alberta President; John B. Ballem, QC; Anne S. de Villars, QC; J. Alan Bryan, QC; Douglas H. McCallum; and Perry Mack, QC, Law Society of Alberta President. Four outstanding Alberta lawyers were recognized for excellence at the 2008 Distinguished Service Awards ceremony held on March 14, 2008 in Calgary. The Law Society of Alberta and the Canadian Bar Association – Alberta presented the awards. Four outstanding Alberta lawyers were recognized for excellence at the 2007 Distinguished Service Awards ceremony held on March 16, 2007 in Edmonton. The Law Society of Alberta and the Canadian Bar Association – Alberta presented the awards. Four outstanding Alberta lawyers were recognized for excellence at the 2006 Distinguished Service Awards ceremony held on March 10, 2006 in Calgary. The Law Society of Alberta and the Canadian Bar Association – Alberta presented the awards. View the program. The recipients of the 2006 Distinguished Service awards and their presenters are (left to right): Richard O’Gorman, CBA Alberta President; Robert J. Campbell, QC; Donald G. Bishop, QC; John T. Henderson, QC; Mona Dukett, Law Society of Alberta President. Four outstanding Alberta lawyers were recognized for excellence at the 2005 Distinguished Service Awards ceremony held on March 11, 2005 in Edmonton. The Law Society of Alberta and the Canadian Bar Association – Alberta presented the awards. View the program. Five outstanding Alberta lawyers were recognized for excellence at the 2004 Distinguished Service Awards ceremony held on March 12, 2004 in Calgary. The Law Society of Alberta and the Canadian Bar Association – Alberta presented the awards. View the program. The recipients of the 2004 Distinguished Service awards and their presenters are (top row, left to right): Don Higa, QC, CBA Alberta President; Peter L. Freeman, QC; Nigel Bankes; Douglas H. Mitchell, QC; and Larry Anderson, QC, Law Society of Alberta President. (Bottom row, left to right): Audrey Dean and Donna M. Hallett. Five outstanding Alberta lawyers were recognized for excellence at the 2003 Distinguished Service Awards ceremony held on March 7, 2003 in Edmonton. The Law Society of Alberta and the Canadian Bar Association – Alberta presented the awards. View the program. Five outstanding Alberta lawyers were recognized for excellence at the 2002 Distinguished Service Awards ceremony. Five outstanding Alberta lawyers were recognized for excellence at the 2001 Distinguished Service Awards ceremony. Six outstanding Alberta lawyers were recognized for excellence at the 2000 Distinguished Service Awards ceremony. Five outstanding Alberta lawyers were recognized for excellence at the 1999 Distinguished Service Awards ceremony. Thomas J. Walsh, CM, QC, LL.D. Five outstanding Alberta lawyers were recognized for excellence at the 1998 Distinguished Service Awards ceremony. Four outstanding Alberta lawyers were recognized for excellence at the 1997 Distinguished Service Awards ceremony. Four outstanding Alberta lawyers were recognized for excellence at the 1996 Distinguished Service Awards ceremony. Four outstanding Alberta lawyers were recognized for excellence at the 1995 Distinguished Service Awards ceremony. Three outstanding Alberta lawyers were recognized for excellence at the 1994 Distinguished Service Awards ceremony.